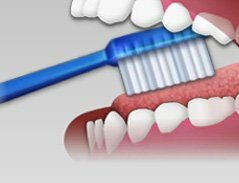 Use a soft-bristled toothbrush and a small strip of fluoridated toothpaste. 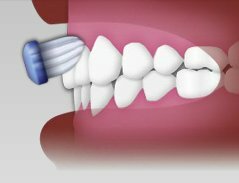 Holing the brush at a 45-degree angle, move the brush in small circular motions across the teeth. 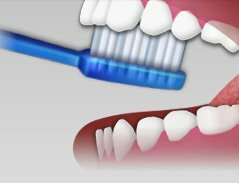 Carefully brush the chewing surfaces of your teeth, making sure to clean the back teeth and between the teeth. 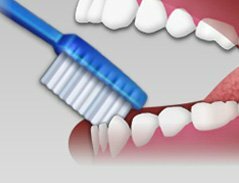 Use the same circular motion to clean the inside of the upper and lower teeth. 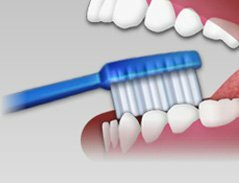 Finish by brushing your tongue and the roof of your mouth before rinsing. Floss at least once a day. Pull a Small lenght of from the dispenser and wrap the ends tightly around your middle fingers. 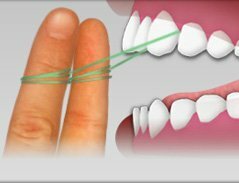 Gently guide the floss between all teeth to the gum line, including the back teeth , to remove any food particles or plaque. 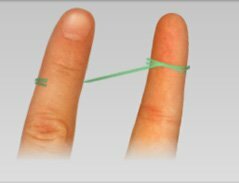 Unwrap clean floss from arround your fingers as you go, so that you have used the floss from beginning to end. The teeth, bones and soft tissue of the mouth require a healthy, well-balanced diet. A variety of foods from the five food groups help minimize and avoid cavities and other dental problems. Consumption of food that contain sugars and starches should be decreased. These food can include candies, cookies, chips and crackers. Healththier food, such as vegetables, low fat yogurt and cheeses, help promote stronger teeth. You should visit your general dentist twice a year (once every six months). In order to maintain a healthy smile, it is vital to have Professional cleanings and regular checkups. Your dentist will examine your teeth and provide an evaluation and existing dental problems and proposed treatment. If you have a dental emergency, you should call your dentist immediately.